South Carolina’s North Coast region is well known for the beaches of the Grand Strand, which attract visitors and residents year-round. Less than 10 miles away are the mighty rivers of the Waccamaw, Great Pee Dee and Little Pee Dee. During storm events, these rivers swell over their banks, closing roads and flooding neighborhoods. The Nature Conservancy and partners are modeling flood risk to South Carolina communities to determine where restoring and protecting the natural features of the floodplain and coasts can best reduce the region’s vulnerability. Increased flooding from King Tides and extreme storms like the floods of October 2015 and Hurricane Matthew (listed as one of the top U.S. Billion-Dollar Weather & Climate Disasters) threaten coastal South Carolina’s communities, industries, infrastructure, and drinking water. The coast is home to over 1 million residents in the Charleston, Beaufort, Hilton Head, and Grand Strand regions. A popular tourist destination, the economy is also driven by new industry leaders such as Boeing and Volvo, and three shipping ports. While regional growth brings demands for new infrastructure and housing, this brings the opportunity for local governments to consider new approaches to reduce risk to life and property from storm flooding and sea level rise. South Carolina communities are working together to implement a coastal resilience approach including proactive assessments of community risks using the best available science. Because natural habitats can reduce hazards due to flooding and storms, natural solutions are being used alone or with traditional structures (sea walls, jetties, groins, etc.). Places where natural solutions can be used is considered a “double win” for people by providing reduced damages during storms and flooding events and increased economic benefits like tourism and fishing are supported by healthy habitats. Horry County, the City of North Myrtle Beach, and the Waccamaw Council of Governments have come together with TNC and other partners to implement a coastal resilience approach to reduce risk to communities in the face of coastal hazards. Collectively referred to as the North Coast, these communities have witnessed the direct impacts of recent storms. Stakeholders are working proactively to identify measures to reduce the threats and damages of storm events, and to identify solutions. Two major threats to the North Coast community are relative sea level rise (SLR) and riverine flooding. Effects of relative sea level rise on North Coast communities include increasing shoreline erosion, increased flooding, saltwater intrusion of drinking water intake sites, and loss of critical habitats, important for supporting the region’s industry, tourism and fishing. Additionally, over 270,000 people live along rivers within floodplain regions vulnerable to storm events. Important infrastructure like major state highways and interstate freeways also run along rivers or transverse floodplains and at risk of flooding, especially when high river flows are exacerbated by heavy rain events or storm surge from hurricanes. The Nature Conservancy and partners have been working on nature-based and community resilience strategies for over 40 years. Land conservation protects our future drinking water sources and allows the naturally swelling rivers to overflow their banks during storms. We have been protecting our shorelines and providing pilot projects by restoring oyster reefs along eroded marsh areas. Successful living shoreline pilot projects installed by South Carolina Dept. of Natural Resources, The Nature Conservancy and the U.S. Fish and Wildlife Service have inspired private property owners who are now interested in using living shorelines to prevent erosion their own property. A regulatory process to guide the design and permitting of living shorelines is currently under development by the South Carolina Department of Health and Environmental Control. Employees from Boeing and The Nature Conservancy build a new Oyster Castle reef on along the Intracoastal Waterway in McClellanville, SC. Natural infrastructure, using natural materials such as oyster reefs over traditional shoreline stabilization, results in numerous benefits to coastal ecosystems. Natural infrastructure reduces erosion and increases shoreline stabilization. It improves water quality while maintaining healthy natural habitats which enhance biodiversity and important commercial and recreational species (such as fish, shrimp and crabs). Currently, South Carolina is in a 5 year process to create a permit for property owners to install Living Shorelines. If you need assistance, contact a qualified consultant or marine contractor who is familiar with the nature based solutions. Property owners concerned about shoreline erosion can learn about living shoreline techniques and find qualified consultants by visiting the Coastal Restoration and Natural Infrastructure Project Database and the Living Shorelines Academy Professional Directory. Healthy wetlands can store water and reduce flood risks while also supporting wildlife habitat and recreational opportunities. For over 40 years, TNC and its private and public partners have been protecting wetland habitats in South Carolina. The ACE Basin project is one of most successful models of public-private partnership for land protection in the country, and in 25 years protected over 200,000 acres. At the heart of the ACE Basin is the St. Helena Estuary, a productive nursery for fish and wildlife with extensive salt marshes, beaches, wetlands, and floodplains. Over 30 organizations have been working together to address flood resilience issues in Horry and Georgetown Counties, and introduce the concept of resilience through natural infrastructure. Three habitats with the greatest potential in these regions are: freshwater, beaches, and marsh. A multi-year plan to address North Coast flooding has been developed and is in the initial stages of implementation including: 1) an assessment of the spatial extent of flooding in the area 2) explicit identification of features that need to be protected or restored to reduce, or not worsen future flooding 3) inclusion of resilience plans into county and city comprehensive plans and 4) identification of restoration projects that communities can implement to reduce flooding (such as headwater stream restoration, constructed wetlands, and low-impact development measures). Success will also require an education & outreach component to reach out to residents who have on-the-ground knowledge of flooding events and can provide input into flooding models. Additionally, including feedback from county and city planning directors will be an essential step in ensuring that this flood risk reduction plan is adopted into community Comprehensive Plans. To maintain and improve natural flood storage and water flows, TNC and partners are currently looking to implement protects that restore and improve management of streams connected to the Waccamaw and Pee Dee Rivers. Using GIS analysis, they are identifying multiple flooded areas as potential restoration projects with the hope that additional priority projects will be identified and some can be adopted into municipal comprehensive plans and Army Corps strategies as a resilience measure. 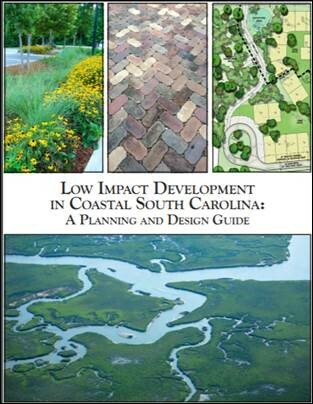 The purpose of this manual is to remove barriers to Low Impact Development implementation by providing engineering tools, planning guidance, and case study examples that are relevant to the South Carolina coastal zone. Goal: Utilize local knowledge and expertise to identify flood prone areas around the rivers in Georgetown County. Outcome: Prioritized list of focus area and nature based projects to reduce flood potential. The Federal Highway Administration (FHWA) is producing research and technical assistance to enable transportation agencies to use natural and nature-based features to improve the resilience of transportation systems. This white paper briefly describes the current state of practice regarding the use of nature‐based coastal solutions in general and with specific emphasis on their use along coastal highways. It provides an overview of available tools for design, implementation challenges, and knowledge gaps. Exploring nature-based mitigation, including post-disaster solutions and their impact. Outcome: Prioritized list of focus areas and nature based projects to reduce flood potential. Geoscience Consultants has developed custom Hindcasted Flooding, Risk, and Land Cover maps and information for The Nature Conservancy to support an ongoing project in Horry and Georgetown Counties.